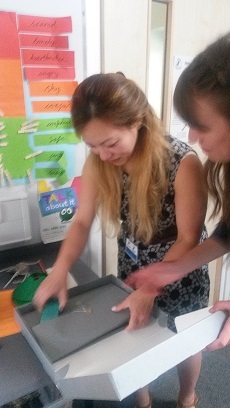 On the 14th of March, I went with a small group of grad students and research scientists from the Sir William Dunn School of Pathology to Windale Primary School in Oxford to teach three groups of 9 to 10 year olds as part of Windale’s Science Week. The event was part of the Wellcome Trust-funded ‘Pencillin in People’ project which is celebrating the 75th anniversary of the development of penicillin at the Dunn School with a programme that also includes archival cataloguing, exhibitions and oral history. 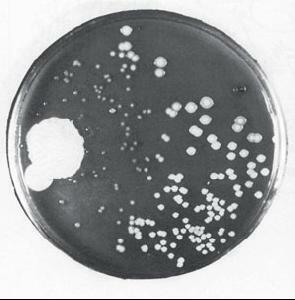 Alexander Fleming’s petri dish of Staph (the white dots) and Penicillium mould (the big blob). Can you spot what’s happened? This was the second of two identical events, the first hosted in the Dunn School Library on the 22nd of February for children from Pegasus Primary School in Oxford. The theme of the day was ‘Penicillin – From Mould to Medicine’, and the children circulated between three workstations, spending 20 minutes apiece exploring bacteria in a “Meet the Bacteria” session and then being introduced to the “Bug Busting Heroes” Alexander Fleming, Howard Florey, Ernst Chain and Norman Heatley and then, to finish, a session on “Making a Medicine” and the production of the penicillin drug. They were asked to peer into a microscope to see a flea in the flesh; to see if they could spot what Alexander Fleming noticed in his famous petri dish of Staphyloccocus and magical mould; and to experience penicillin in action by bursting a “bacteria” balloon. They learned all sorts of new things (an embarrassing amount of it new to me too) including scientific terminology like bacterium and micro-organism and DNA; the variety of shapes bacteria take; and the amazing things these Oxford scientists achieved with salvaged equipment like bedpans and biscuit tins. They also learned what antibiotics do and what antibiotics don’t do, which is ever more important in a world of antibiotic-resistant bugs. The plan for the day was to teach the children about this particular, awe-inspiring historical moment, a world-changing medical breakthrough that happened right here in their city – but we also wanted to inspire them with the wonder of discovery and, ultimately, to encourage them in the direction of science. Time will tell! A couple of weeks ago Emily and I asked a class of year 6 pupils this question as part of a careers session organised by the Oxford for Oxford project. “Is it like a receptionist?”, “do you fix big things?” and “is it like an architect?” were some of the answers we received. We soon realised we were going to have a hard time explaining what an archivist was. We had three groups of about 10 students each, all keen to break up their routine and guess what these strangers do all day. They may have been slightly disappointed that we weren’t astronauts, but soon got over it. We discussed how important archives were to researchers because they preserve the evidence of the past in primary sources and accounts. Admittedly we were slightly thrown when a pupil asked us what we thought about the controversy around Shakespeare’s authorship, but this was a great lead into showing the need to preserve primary documents. We talked about what we can still learn from them and how history is constantly being written and rewritten. A boy in the first group asked us if we looked after things like video games and this gave us a great excuse to start talking about digital archiving and how it’s not all about really old stuff. This got them thinking about what will happen to everything they see online in the future. We showed them what we use to package archival material and explained how the boxes, brass clips, and folders protect paper from deterioration. We also talked a bit about storing other things like websites, emails and Facebook. After the talk we had time for an activity investigating some documents from our collection. We showed them a cipher and key from a letter intercepted during the Civil War to demonstrate how you can learn about history first hand using primary sources. 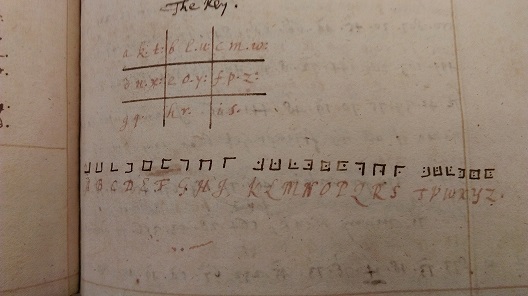 This particular cipher was decoded by John Wallis (1616-1703), chief cryptographer for Parliament in the Civil War. Impressed with his own work, he donated the manuscript for posterity to the Bodleian- effectively a national library at the time with holdings of many large and important collections. 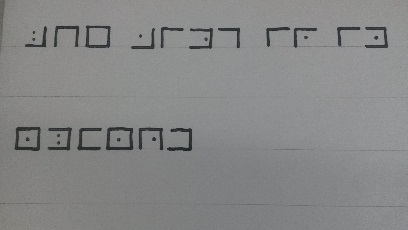 We had created a message using this cipher and the pupils were tasked with decoding it. The later groups heard about the cipher activity and assumed we were cryptographers; an unforeseen difficulty was persuading the groups to keep the secret message secret! Although at the end of the day the top career choice was probably doctor or engineer, we think they enjoyed our talk and at least now they know an archivist isn’t a receptionist! The session was organised by Dr Anna Caughey from the Oxford for Oxford project. You can find out more at http://www.ox.ac.uk/oxford-for-oxford We enjoyed talking to the pupils and hope they’ll be able to visit the Shakespeare exhibition here at the Weston Library to put their theories to the test!